Yellow is the colour of the sun, of gold, and of fields of grain in the autumn just prior to harvest. Hence it is associated with richness, abundance, and fecundity. 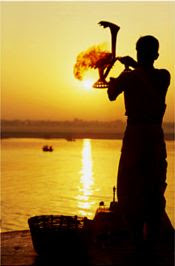 The sun is probably the most important thing in India and features in the mythologies of all the various sub-cultures. It is also a potent symbol. For the last five years I've lived in Cambridge England. When you are 52 degrees north of the equator the sun is never directly overhead. But in India the sun is high in the sky even in winter. The sun is the key to everything. Just enough and the plants grow and ripen, but too much and plants, animals and people start to die. The sun has many names in India - Sūrya, Vairocana, Prabhakara, Āditya, Mitra, Savitri, etc. Gold is a precious substance where ever it is found. Gold does not tarnish. It is both ductile and malleable and can be made into any shape, or beaten so thin that light passes through it, picking up a greenish tinge on the way. The Aryan people were golden skinned, and Buddhists insisted that the Buddha was the colour of gold. So it should come as no surprise that the Yellow, or Golden Rite is the Rite of Abundance and Increase. This rite can be used to gain wealth, to be materially rich, but spiritually speaking the greatest wealth is not material, it is knowledge and vision of how things really are. However there is often a middle ground in the use of this rite. In the Tara Tantra it says by this rite, one will be endowed with necessary goods, long life, beautiful appearance, and strength. 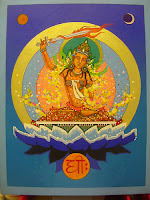 In the form of the Tara mantra addressed to White Tara one requests that Tara grant you long life, merit and wisdom. But why these qualities? It is said that these things - long life, beauty, strength, merit, wisdom etc. - all help the Bodhisattva to spread the message of the Buddha and to sustain them in their repeated sojourns in saṃsara. One requests the material things that will best support one's spiritual progress in other words! I'll talk about two applications of the Yellow Rite: gratitude and generosity. With my usual disclaimer about my rather idiosyncratic approach to this kind of magic. Even if things could always be better, anyone well-off enough to read these words on the internet probably has plenty to be grateful for. Gratitude is a way of creating awareness of abundance, the abundance that we already have, and which can help to counteract the feeling that we don't have enough, or even that we aren't good enough. From a state of abundance, we are always ready to give, which leads us onto generosity. Generosity is giving from a sense of abundance, and it creates abundance for others. I've written quite a bit about generosity in my take on the six perfections for instance, or in the story of my generous friend Kapil. I see one of the primary aspects of generosity as making us aware of other people. But the Yellow Rite it is also a way to create a sense of abundance in everyone around us. If we all gave until we "swooned with joy" then what abundance there would be! Generosity is also about letting go of attachments, and this again creates a sense of abundance in us. You can see that I am not advocating the Yellow Rite as a way of getting what you want, although this aspect of the rite is present in the texts. The Buddha was quite clear that amassing a fortune, acquiring lovers and families, storing up food, or gold, or favours, etc would not provide any lasting satisfaction. At the very least we are all going to die. A mountain of gold will not change this fact. A dozen beautiful lovers will not prevent us getting old. And most of us will get sick at some point despite having a hundred DVD's in our collection. Actually it is possible to be happy and have very few possessions. Remember back in the 1980's when Ronald Reagan was pursuing the arms race with Soviet Russia and it was announced that there were enough nuclear weapons on both sides to destroy all life on the planet 100 times over? I remember thinking how insane that situation was. I remember thinking what's the point? Sometimes having more of something is completely pointless. In my blog post about the yellow Buddha Ratnasambhava I pointed out that he represents both our highest ideals - the jewel of Awakening - and our most fundamental value - generosity. The Yellow Rite is concerned with activating the latter in pursuit of the former. * Ariel Glucklich (1997) The End of Magic. Oxford University Press Inc, USA. Manjughosa and his twin Manjusri are well known Mayahana figures. Both are youths of 16, the colour of a tiger's eye, brandishing a flaming sword, and holding a book - the Pefection of Wisdom in 8000 lines. Their mantra is pretty common in the FWBO as it's one of the nine chanted at the end of seven-fold pujas: oṃ a ra pa ca na dhiḥ. Om is a sacred Indian sound symbol which is at once very simple, but very difficult to write about without becoming trite. Dhih is a seed syllable which is associated with perfect wisdom. Again I find it difficult to write much about dhih. It seems to me that the om and dhih simply indicate that arapacana found a home in the generalised Mahayana cult of the dharani (about which more another time). However I recently turned up something interesting about arapacana that I would like to share. arapacana is made up of the first five syllables of an alphabet which occurs in the Perfection of Wisdom in 25,000 lines - translated by Edward Conze as The Large Sutra on Perfect Wisdom. I need to clarify 'alphabet' a bit. Actually Sanskrit is a syllabic language, which means that a consonant is almost always associated with a vowel. The most basic, unmarked, form assumes the short 'a' vowel sound which you hear in the English word but. That's why the 'alphabet' is not written in roman characters as arpcn! So this alphabet is spelt out in the Sutra, and each syllable is associated with some aspect of perfect wisdom. A, for instance, stands for anutpada - unarisen - and refers to the idea that no actual 'things' ultimately exist, that there are just conglomerations of conditions which are constantly changing. One of the most important conditions being our perception and the associated mental processes. The alert amongst you will already have clocked that the Sanskrit alphabet does not begin a ra pa ca na - it begins with the vowels a, i, u, e, o, etc, in their short and long forms. Even the consonants start with ka, kha, ga, gha, nga, etc. So this is not the Sanskrit alphabet. Some scholars have postulated a Gandhari origin, or that it relates to the Karoshthi alphabet. * The earlier Lalitavistara Sutra also has an alphabet of Wisdom - this one is Sanskrit. But why? What is special about the alphabet? The answer lies, I suggest, not in Buddhism at all but in one branch of Vedic exegesis known as Mimamsa (miimaa.msaa) which has origins almost as old as the Vedas themselves, although the first systematic account was Jaimini's Mimamsa Sutra probably written about 200 BCE - about a century before the Lalitavistara Sutra. "The word gauh (cow) is nothing more that the three phonemes which are found in it, namely g, au, and h... It is also these very phonemes which cause the understanding of the meaning of the word". The early Upanishads contain several little treatises on the associations of syllables with esoteric meaning - Chandogya 1.3.6 for instance. But Shabara has taken this to it's logical conclusion and given significance to all of the syllables. This doesn't entirely solve the problem of logically establishing the revealed nature of the Vedas, but that need not distract us at present since that is not our project. Shabara wrote in the time immediately preceding, or even slightly over-lapping, the rise of the Mahayana. We know that Buddhists, in accordance with the general Indian approach, were apt to incorporate any practice or idea which could be adapted to their use. It seems to me that in this case the Vedic linguistic speculations were adopted, and developed. The apotheosis of this occurs in the Mahavairocana Abhisambodhi Tantra where visualisation of the Sanskrit alphabet is recommended as a meditation practice. It is interesting to note that this ancient India interest in the significance of words or syllables prefigures much of modern linguistics. Ferdinand de Saussure himself had held a professorship in Sanskrit before giving his lectures on general linguistics in 1910-11 that have set the agenda of linguistics ever since. 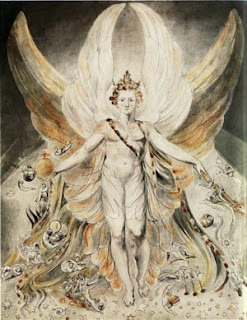 Another interest contemporary parallel is in the research of Margaret Magnus. Magnus's doctoral thesis explored the way that phonemes (the smallest unit of articulate vocal sounds) bear meaning. Standard linguistic theory tells us that phonemes have an arbitrary relationship to meaning - that the sounds we use to indicate things or concepts are arbitrary and conventional. I don't have space in this post to go into the details of Magnus's findings, but I have repeated many of her experiments and I believe that phonemes are not entirely arbitrary. The arapacana mantra, then, stands as an embodiment of a principle, put forward by the Mimamsa school on the basis of Upanishadic speculation, but taken up by Buddhists around the time of the rise of the Mahayana: that each and every articulate vocal sound has significance. ** Guy L. Beck. Sonic Theology. (Delhi : Motilal Banarsidass, 1995, 1993), pp.61. Sound files from my evening on the Arapacana Alphabet at the Cambridge Buddhist Centre, 1 Nov 2007. A led meditation on the first five letters of the Arapacana Alphabet. 15/3/08. I've just added a page to visblemantra.org which pulls out the bits of the Pañcaviṃśatisāhasrikā Sūtra related to the Wisdom Alphabet meditation, with a few added comments.